Parenting is the most rewarding job in the world. It is often also the most tiring, especially when you have a little one who isn't a great sleeper, who doesn't like going to bed or who is going through a phase of interrupted sleep. As well as parents missing out on valuable sleep little ones not getting their full quota doesn't do them any good either. Sleep is great not only for resting and recouping lost energy for the next day, sleep time is the time most of us and especially children process what they've seen, heard and experienced during the day and learn from it. We've had a rally around Dotty Hippo HQ to pull together some of our best tips for promoting a good sleep routine. If you have more to add please leave a comment as we'd love to hear! Routine, Routine, Routine Routine is the golden word as far as parenting goes as many children (and parents) go as with a routine in place everyone knows what comes next, who does what and routines may be reassuring. How your routine works will depend on your child or children, their bedtime, how many people are involved and other such things. Whatever your routine is, when you find something that works stick to it. Wind Down Time It is a lot easier to encourage a little one to settle into bed if they have already had a period of time where they stop running around and relax. Some people use the CBeebies Bedtime Hour, others use bath time, noisy toys could be switched out for quiet ones or perhaps this time is a time where TVs, devices and anything which may be noisy and distracting are switched off or put away so that little ones may enjoy some cuddle and chat time. Again, whatever you do during wind down time be consistent. Bedtime Reading Once in bed the perfect way to finish the day is with a story. Allowing reluctant bed-goers to choose which story will be enjoyed may also help, as might inviting guests of the fluffy teddy-shaped type into bed to listen too. Story time can be a magical time and one which both parents and children enjoy before little ones nod off. The Perfect Bedroom Some children simply don't like bedtime which may be difficult. Making going to bed something special and an adventure often does help. Make the bedroom somewhere that the children want to be. Decorate in favourite colours, choose bedding they love and personalise the space. Some children struggle in the dark so instead of having a bright lamp on or spending a fortune on keeping a landing light on all night using an energy saving nightlight can be very reassuring and solve a lot of bedtime sleep anxiety. Do you have any top tips for bed time? Do you sing? 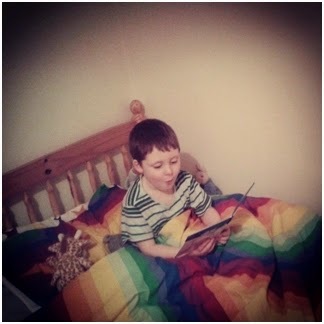 Is there a special game to encourage little ones into bed? If so we'd love to hear more!